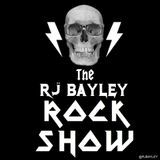 RJ Bayley Rock Show 109 - 30.09.2018 w/ Halestorm Fall 2018 concert review. The finest in hard rock & heavy metal. Includes interviews with musicians, commentary, gig and music reviews, and waffling from me, your mildly tolerable host, RJ Bayley. Contact @RJBayley on Twitter and say something awful to me. Broadcast on Scotland&apos;s Castle & Links Radio, from Edinburgh, Scotland, every week.